This story first appeared on CityLab on January 12, 2018. Find the original here. 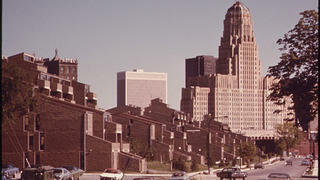 Buffalo's Shoreline apartments seen around the time it first opened 40 years ago. He moved in 10 years ago, after suffering a severe heart attack. Since then, he’s documented his fight against Norstar, the private company that manages the state-built homes; he alleges that the firm essentially allowed the property to deteriorate, then received public funds for a replacement project with half as many units. The first phase of Shoreline’s demolition and redevelopment began in 2015, after efforts to landmark it for preservation failed. The final phase is scheduled to take place this spring. Earlier this month after a protest against Norstar’s actions, the company issued a statement, saying: "We are pleased that we can bring people very nice, new affordable housing in the downtown business corridor. We do have to relocate these people to rebuild housing, people will be able to come back, but they do have to qualify under that state's section 42 low income housing regulations. But at this point, all of our residents are income qualified." They took my TV, DVD player, DVD collection, and a bunch of household items. They trashed the place randomly—not looking for stuff as much as just acting out of malice. They took a garbage bag from the bathroom and put it over my laundry, that’s not something a typical burglar would do. The contents of my closet were pulled onto the floor, too. I also lost some other electronics, so I carry my remaining things. My laptop and hard drives are in my backpack and I never leave home without it. John Schmidt was officially evicted from his apartment on January 12, 2018. His belongings remained inside even after he was forcibly removed from his home.